A LAB study shows global warming that increases sea-surface temperatures would make cold-blooded creatures of the sea vulnerable. A slight increase in temperature may be conducive to growth. Above a certain temperature threshold, the metabolic demands of tissues such as supply of oxygen progressively limit the energy available for growth and the growth rate begins to decline. 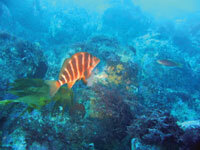 Anna Ne-uheimer and other researchers from the Commonwealth Scientific and Indu-strial Research Organisation, Australia, studied changes in the growth of the banded morwong, a shallow water fish in the Tasman Sea, one of the fastest warming areas in the southern Pacific Ocean. Just like the growth of a tree can be determined from the rings, the age of a fish can be determined from otoliths, bony structures in the fish’s ear. They can be used to explore the link between temperature and growth rate of the fish in the ocean. Researchers studied the otoliths and calculated the fish growth between seven and nine years of age. “The number of rings in the lifetime of a fish provides a record of the age and distance between otoliths, can be used to reconstruct the growth rate,” says Neuheimer. A previous study in the April issue of Proceedings of the National Academy of Sciences, observed a 30 per cent increase in the growth rate of the banded morwong between 1950 and 1990, a period when shallow waters were rapidly warming, including that of the Tasman Sea. The present study published in the April issue of Nature Climate Change expanded the above analysis to gather data on growth rate changes of the banded morwong at five locations around southern Australia and New Zealand. They gauged the response of growth rate to temperature over 90 years and across the species’ distribution and found that growth rate increased with rising temperatures in the cooler waters off Australia but decreased with rising temperatures off the warmer coast of New Zealand.